We’ve heard how Thunderstone Quest – Back to the Dungeon will have a cooperative mode where the players defend the village from monsters, including a particularly strong and nasty Guardian. The latest preview explains how exactly the heroes will work together. You’re obviously supposed to coordinate your actions, but your cooperation can go further. For tougher monsters and the Guardian you can gang up and form a party. Happy hunting! The Captain from The Captain is Dead did not get better. He’s still dead. The remaining crew are in even more trouble after their adventures from the first game. Having just repaired their starship’s jump core and escaped they somehow landed in an alien prison. 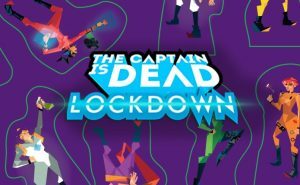 Escape from that prison is the objective of The Captain is Dead: Lockdown, a standalone sequel. Pretty much all boardgames use your sense of sight, some use hearing to communicate with the other players. (I can think of one game that uses your hearing more directly.) Some games test your sense of touch, but they are a rare breed. Soon there’ll be another one of those, though, with Pandasaurus Games’s Nyctophobia. The titular fear of the dark will be literal, all but one player will wear dark glasses and only experience the game board by touch. They have to lead their pawns through a dark forest on the run from one of two opponents, controlled by the seeing player. The Axe Murderer is simply after them. The trickster Mage is out to confuse them. He may turn the game board and move trees around. There is another variant with a vampire, but I don’t approve of exclusives for one store chain, so I’ll ignore that one. Rurik: Dawn of Kiev, the new Kickstarter by PieceKeeper Games, brings something fresh to good, old action selection. The fight for control of medieval Kievan Rus will be held with what they call auction programming. You pick your actions on a central board with five columns, one per action. The higher the value of the worker you send the the greater the effect will be. However, the lower the number the earlier you resolve the action. Spending money together with a worker lets you have both benefits: he still resolves at his original number, but each coin improves the effect. Only five different actions to produce resources, control lands and fight other players, but how you pick them will make sure that there are no easy decisions. In response to Azul being nominated for the Spiel des Jahres award we’re not getting an expansion, we’re getting a full-fledged sequel. Azul: Stained Glass of Sintra will be mechanically similar to Azul, but instead of tile mosaics you’ll recreate the famous windows. It won’t be the same game with a different theme, however. The panels the players construct their windows on will be double sided and offer more variety, and I’m sure there’ll be other differences to keep veteran Azul players on their toes. Pretty, highly detailed plastic minis always go on Kickstarter. Cthulhu always goes. And CMON games tend to be popular because they’re also very good games. Coop game Cthulhu: Death May Die by CMON was sure to be a success already, and then you mention that it’s a design by Eric Lang (Blood Rage,…) and Rob Daviau (the whole Legacy thing). Cthulhu: Death May Die is not a Legacy game, but it’s not a game to play once and then you know everything, either. Two Great Old Ones, Cthulhu and Hastur, each combine with six plot episodes for a total of twelve horrifying experiences on the modular game board. And then we should finally move away from the term minis for sculpted plastic game pieces: The expansion R’lyeh Rising brings a Cthulhu sculpt that is 57centimeters high (1.3 cubits, if you’re not using metric). Its base becomes the game board, and if you leave it near the window your neighbors may call the police. New California has absolutely everything you would want from an expansion to Fantasy Flight’s Fallout boardgame: New heroes, new locations, new loot, all that in the beautiful, radioactive landscape of California. Oh, and new scenarios, of course. In one of them each player chooses to support the Brotherhood of Steel or The Unity – veterans of the video games will remember. The other introduces a new cooperative ruleset. Players have to save the village of Arroyo from the drought (and probably other dangers). Also new, there are now different versions of cards where you make decisions, so you will get a different story depending on the copy you pick.